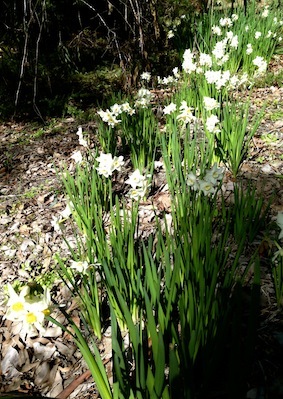 Jonquils – Spring is here already! Lately, I’ve been thinking about the meaning of the word “heart”. In Japanese, the name of the Heart Sutra is 般若心経 (Hannya Shingyo), and the third Japanese character 心 means ‘heart’. In English, we tend to distinguish between ‘heart’ and ‘mind’, whereby the heart is the location of emotions and feelings and, of course, a symbol of love; and the mind is the location of consciousness and thoughts and knowledge. But in Japanese, the word 心 means both heart and mind – there is no separation. This becomes quite a problem when translating into English because I must stop and ask, well which one is it – heart or mind? But lately I’ve started to question this apparent separation between heart and mind, feelings and thoughts, as realise that it’s not that clear cut after all. The full name of the Heart Sutra is the Heart of the Practice of the Perfection of Wisdom; that is, heart as ‘essence’, as the intrinsic nature or deepest underlying quality of something. And this is what we mean when we say we are getting to “the heart of the matter”: getting down to the essential and profound aspect of something. It also means to realise in a clear thinking way some deep underlying truth about something. When we get to “the heart of the matter” we gain some insight into the “truth of the matter”. Beyond just knowledge, getting the heart of the matter brings forth an awareness of wisdom from the core of our being; it is through our hearts that we can gain wisdom, which we recognise with our minds as containing some deep truth. In that moment of insight – at the heart of the matter – we are using our minds to understand this; that is, there is no separation between heart and mind at that point. 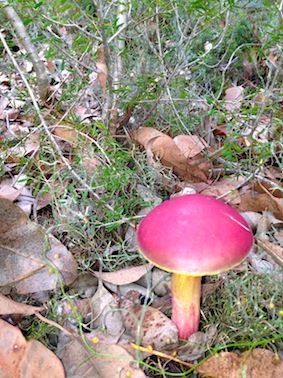 Mushroom in my garden – that is its true colour! And when we offer our “heartfelt” thanks, what do we mean? Something “heartfelt” means coming from the very core of our true being, it means something that is fundamentally authentic and true and pure: the wellspring of our being. So “heart” also equates with the essence of who we are – natural and unadorned and truthful. But when we offer our gratitude, in that “heartfelt” moment it is through our minds that recognise this gratitude and we think of words to express our thanks. Again, there is no clear separation between our heart and mind in that moment of offering heartfelt thanks. This entry was posted in Buddhism, Spirituality, Teaching and tagged hannya shingyo, heart, heart of wisdom sutra, Heart Sutra, mind. Bookmark the permalink. Such a wonderful piece Cate, further ‘heartened’ with that astonishing video. My heart did flip flops 🙂 everything seems brighter…lighter. My dear heart has always led the way…. Heart you back ❤ 🙂 <(").